Contenders who are interested to apply Accenture jobs must check the eligibility criteria as per the company norms. Candidates can check the details of eligibility criteria and all other necessary details that are equipped below. We have provided some simple steps to apply for Accenture Off Campus Drive 2018. In this review, Accenture Off Campus Drive 2018 details are furnished in this article. Job aspirants have to refer Accenture placement papers and Accenture Test Pattern to crack Accenture Online Tests. Before starting your preparation you should always check latest Accenture test pattern and syllabus. In this review, Accenture Recruitment information is provided here for the Fresher graduate and Post Graduate applicants. Getting a job in Accenture is a prestigious thing. Who will clear all the rounds, the company officials will provide the best pay scale, benefits, and incentives to the selected candidates. Have a glance on below page developed by the expert team of sarkarirecruitment.com. Accenture is one of the biggest and well known company in India. Every year Accenture hire both freshers and experienced candidates across India. Accenture recruits the candidates through Accenture Walkins, Accenture Recruitment Drives, Accenture Placement Drives, Accenture Referral Drives etc. Accenture usually hires every year and recruit many candidates and offer them with very good salary package. Provides free up and down cab facility in between 40 km, and free food facility. One of the plus point to work in Accenture company is working environment. 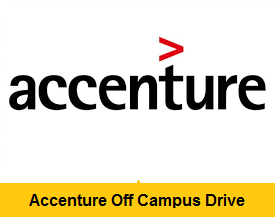 In this post, we have provided all the Accenture Off Campus Drive 2018 details. Please read it carefully and apply for this post as early as possible. The team of Sarkari Recruitment always try to post all the current vacancies across India. If any candidate have any issue they can comment us we will try to respond you guys as soon as possible. Full-time course completion candidates are eligible. Good understanding of Core Java, Java Concepts, Java Enterprise Edition. Knowledge on J2EE, Spring, Hibernate, Servlet. Aspirants who had possessed graduation in any discipline in BE, B.Tech, ME, M.Tech, MBA, MCA are eligible to apply. M.Sc in Computer Science, Information Technology, MCA with B.Sc, B.Com, BCA, BA (with Math, Statistics, Computers Background) are most welcome. The participants must have an aggregate of 60%. The participants should have an aggregate of 60% in all academic courses. A Maximum of 1 year gap is allowed in education. It is mandatory to each and every candidate to clear backlogs at the time of appearing for Accenture Off Campus Drive 2018 Selection Process. Candidates who are interested in working with Accenture shouldn’t have any backlogs. While appearing for the Accenture Off Campus Drive 2018 Selection Process have to show the PC, CMM, and valid ID Proof these are mandatory. The Accenture selection process consists of various levels. There is no fixed rounds it decides instantly. Based on the performance shown by the candidates in the selection process will get hired by the recruiters in the Accenture company. In order to beat the tough competition, candidates have to practice more and more for the Accenture Off Campus Drive 2018. Who clear the rounds completely and confidently those people will easily be placed in Accenture MNC Company. The Accenture will decide the salary based on the job roles, company rules, and regulations. Accenture will give the finest pay which was offered in the market. Women candidates are encouraged to apply for Accenture Off Campus Drive 2018. Though this is not a BPO job, aspirants are expected to work in a 24×7 environment. Applicants must bring Identity Proof issued by the government. Carry all academic certificates xerox copies including PC, CMM. In this section, we are providing the tips to crack Accenture Off Campus Drive 2018. Practice Accenture Placement Papers, Accenture Test Pattern, and Accenture Interview Questions. Be confident and look straight at the time of HR Round. Prepare basics of Technical subjects. Don’t sit silently at the time of interviewer asking questions. Answer questions confidently whether it is right or not. Visit the official website or apply from the given provided link. Read the entire application form carefully. Fill all the questions which are asked in the Registration Form and Submit it. Note your Reference ID and Password for further use. Grab further information about Accenture Off Campus Drive 2018 from the official website. Candidates can share your experience with us by commenting in the below section. If you have any question ask us we will clear as early as possible.